Jeffrey Cerciello, Thomas Keller’s long-time culinary lieutenant, played a key role in developing Ad Hoc’s fried chicken. 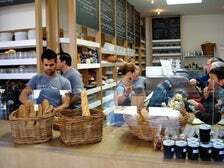 Since 2010, he’s run Farmshop in Brentwood Country Mart and up north in Marin County. 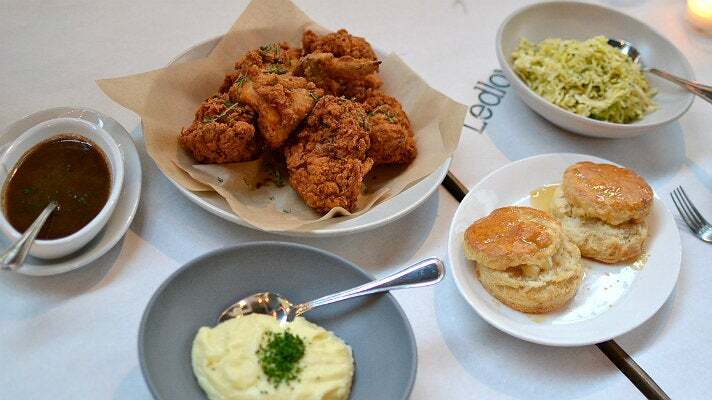 A version of the famed fried chicken is a regular star of the multi-course Sunday Supper. In this case, Jidori chicken with concentrated flavor is brined overnight and hit with flour, buttermilk and more flour before frying in vegetable oil. Fried rosemary and a dusting of Maldon sea salt are the chicken’s savory garnishes. Complementary courses and sides change seasonally, but recently included Thorne Family Farms heirloom tomato salad with Di Stefano burrata, arugula, basil pesto & pine nut crumble; Anson Mills sweet corn polenta with Bellwether Farms jersey milk ricotta; Roman-style marinated artichokes with cauliflower, piquillo peppers and mint; and lemon semolina cake with raspberry curd and candied lemon zest. Napoleon “Na” Vanderbilt, wife Maggie, and son Vernon “Gus” Bonner helped to bring the family’s fried chicken recipe into the pantheon from their perch in the Memphis suburb of Mason. Longtime fan Wendy McCrory licensed the name, starting with a Memphis branch in 2001 and subsequently expanded their uniquely “hot and spicy” fried chicken to cities like Chicago, Detroit, and Kansas City. 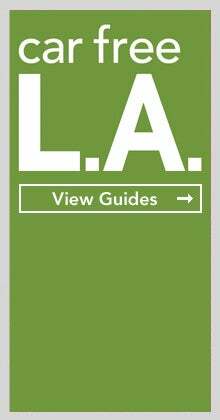 2016 saw the rise of Gus’s World Famous Fried Chicken in L.A., located at the corner of the Coyne Building in Mid-City. The space features brick walls, concrete floors, wood banquette seating, three flat screen TVs, framed blues concert posters, and multi-color checked tablecloths. Hormone-free chicken undergoes two days of prep, starting with a top-secret marinade, before getting fried in peanut oil. 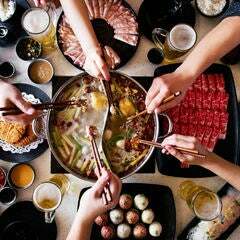 Go with meat that’s on the bone instead of tenders and enjoy crisp skin with thin, judiciously spicy coats. 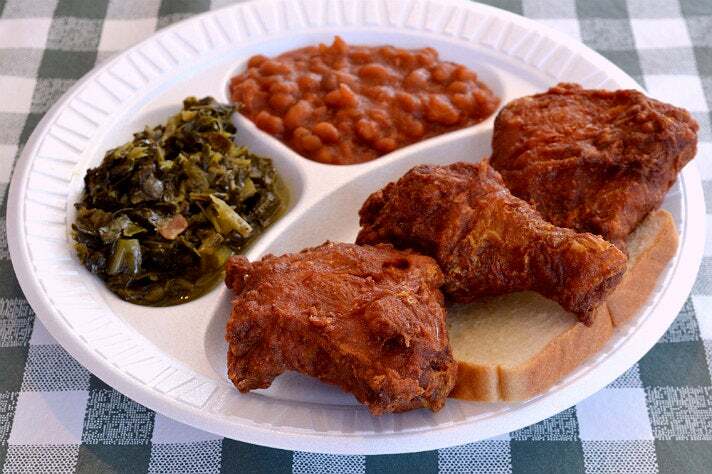 All plates come with baked beans and slaw, though you’re welcome to sub in greens or mac and cheese for a small fee. 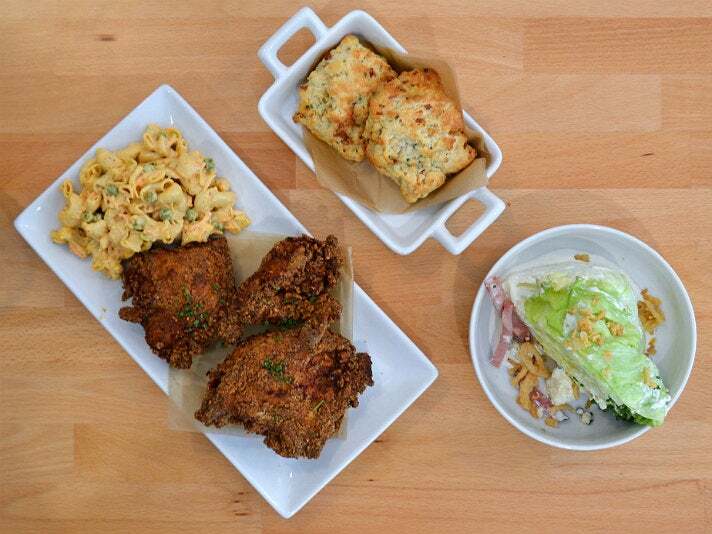 Chef Phil Lee is a longtime area resident who brought the hunger for fried yardbirds north by opening Honeybird in La Cañada Flintridge. The airy space houses white walls, light wood tables, a wall of decorative stone glasses, and a prominent pie case. Order at the counter and grab a number and table. 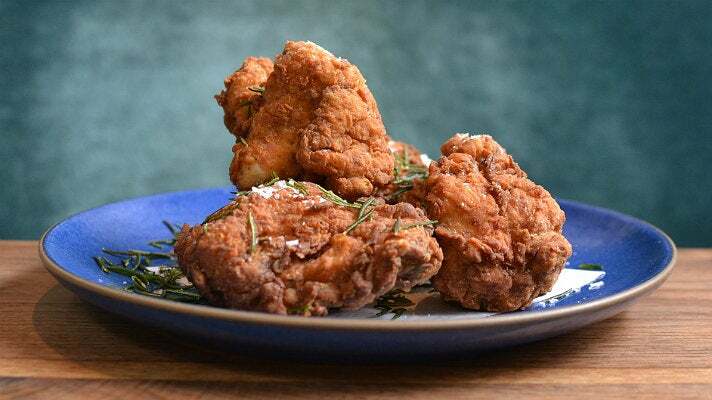 Fried chicken utilizes organic, hormone-free birds that are brined for 28 hours in a proprietary herb and spice blend before pieces are dunked in bubbling soybean oil. 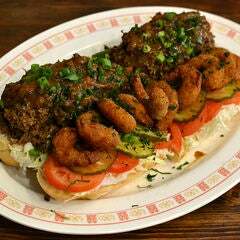 The chicken is well seasoned, with thick but not overwhelming batter, and comes with a choice of sides. Chipotle macaroni salad is a standout, folded with shredded carrots, English peas, and chipotle aioli. A wedge salad combines crisp lettuce, julienne country ham, blue cheese, fried onions, and house ranch dressing. Fried chicken sandwiches are also popular, including the signature Honeybird with crispy boneless chicken breast, rich Pimento cheese, tangy cider slaw, and punchy pickled chilies on a toasted brioche bun. L.A. born chef Johnny Zone and his wife Amanda Chapman studied hot chicken at the source – Nashville – and started with a food truck before opening a fully realized brick and mortar realization in Chinatown’s Far East Plaza to start 2016. Décor consists of decorative plywood, an open kitchen, a wall-mounted menu, and two framed paintings of Gram Parsons, another person who wasn’t born in Nashville, but connected with the city. 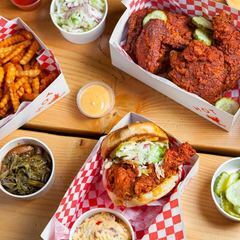 Fried chicken utilizes a proprietary pepper blend that ranges from “country,” which falls short of mild, to “howlin’,” a spice level that’s liable to burn a hole in your cheek. Get a whole bird or pieces of your choice. Howlin’ Ray’s also serves a terrific fried chicken sandwich with juicy breast meat on a buttered bun with cabbage slaw, pickles and spicy “comeback sauce” crafted with chile powder, paprika and more. On weekends, they serve chicken and waffles, and neighboring coffeehouse Endorffeine will gladly pair a maple bourbon iced latte made using cold brew, Clover milk, and maple Bulleitt bourbon syrup. When a dish works, it can be difficult to contemplate making a change. 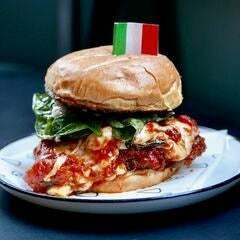 However, at Huckleberry, the perpetually crowded Santa Monica café and bakery from Chef Zoe Nathan and her husband Josh Loeb, they were willing to overhaul the original recipe. Since 2012, Free Range Fried Jidori Chicken has been buttermilk brined and coated in a crust crafted with flour, cayenne and hot sauce. This juicy chicken is only available on Fridays by the half-bird and comes with comforting cornbread and coleslaw. Each night, Chef Josef Centeno features a different special at the airy downtown restaurant he owns with Peter McLaughlin. 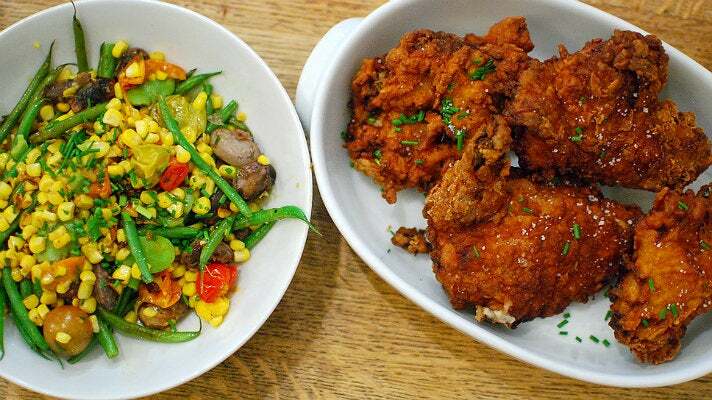 On Monday nights, $35 per person scores you an epic fried chicken feast. Centeno sources free-range Pitman Farms chicken, which enjoys a special spiced brine and marinade in tangy “ranchy-yogurt inspired blend.” Pieces sport thick batter and take a dip in sizzling soybean oil. Each meal comes with crunchy cole slaw, substantial, buttery biscuits and gravy crafted with roasted chicken jus that’s mounted with butter. 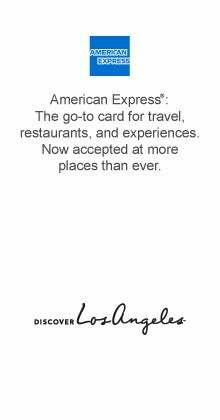 Chef Ernesto Uchimura teamed with entrepreneur Terry Heller on an industrial chic comfort food mini-chain that now includes branches on Fairfax, Downtown L.A. and the Westside’s recently redubbed Sawtelle Japantown (formerly Little Osaka). Yes, Plan Check churns out some boldly flavored, creative burgers, but Uchimura’s become nearly as well known for fried chicken. 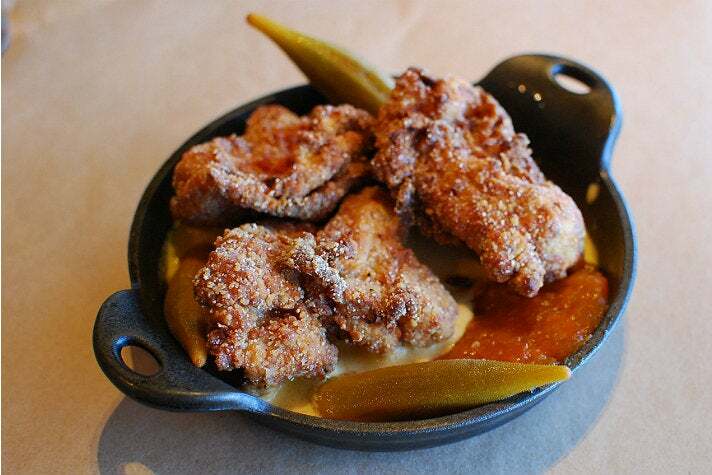 His Smokey Fried Chicken features boneless, crisp-sheathed Jidori chicken in a shallow pool of smoked milk gravy with candy sweet yam preserves, with a skillet that’s accented with tart, crunchy, spicy pickled okra. Dig deep and you might remember this historic Koreatown restaurant as the backdrop for a dinner with Don Draper, Roger Sterling and their (first) wives in Mad Men. 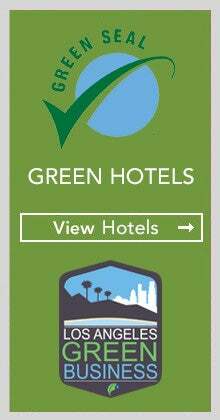 Even people who didn’t watch the show will still enjoy The Prince’s old school grandeur, which has been going strong since the 1920s at its location near the former Ambassador Hotel. 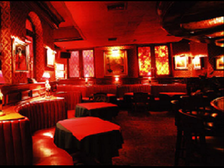 The space was designed beautifully for a night out, complete with red booths, octagonal tables and live piano playing. 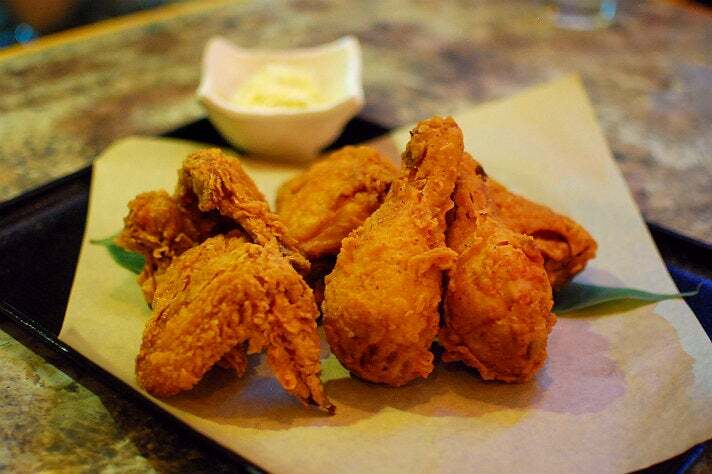 Korean food was not on the restaurant’s opening menu, but The Prince has become synonymous with Korean fried chicken. 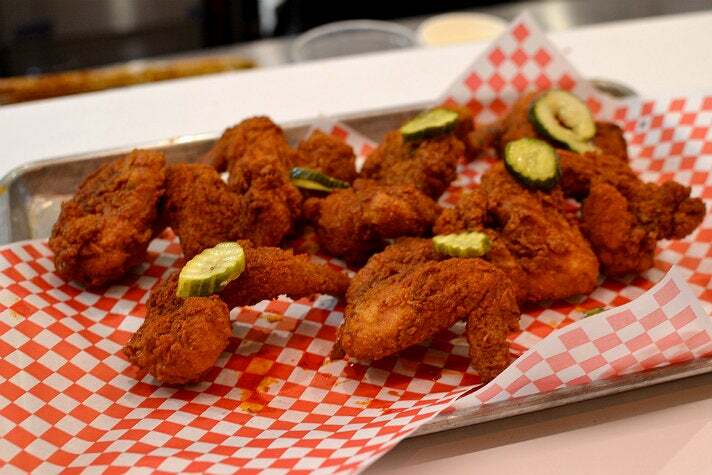 Order a half-chicken either crisp-skinned and batter-free or lightly battered and tossed in spicy chile paste. Better yet, split the difference and order the Half & Half. Regardless, expect salad with Thousand Island dressing and tart pickled radish cubes. In 2013, Chef Kouji Yamanashi transformed his Monterey Park strip mall restaurant from The Open Door izakaya into the highly focused Tokyo Fried Chicken Co. The space features a green façade, clean wood lines and blackboard beverage menu. Chef Yamanashi takes what’s great about Japanese chicken karaage and serves the bird bone-in, which results in succulent meat. An addictive marinade includes ginger, garlic and soy sauce. 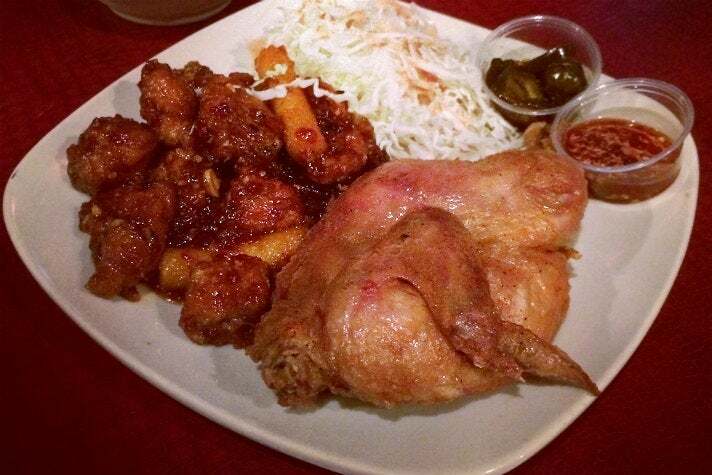 The chicken is fantastic on its own, though you can squeeze sauce (regular and spicy) from ponzu bears. Chicken rice and pickled ginger cabbage automatically come with your meal. Creative sides include soy-glazed carrots with bacon, and mac & cheese with sharp white cheddar and nori. Fried chicken rarely gets more unique than the version served at Ade Kurniawan’s Indonesian restaurant, located in Alhambra amidst auto body shops. 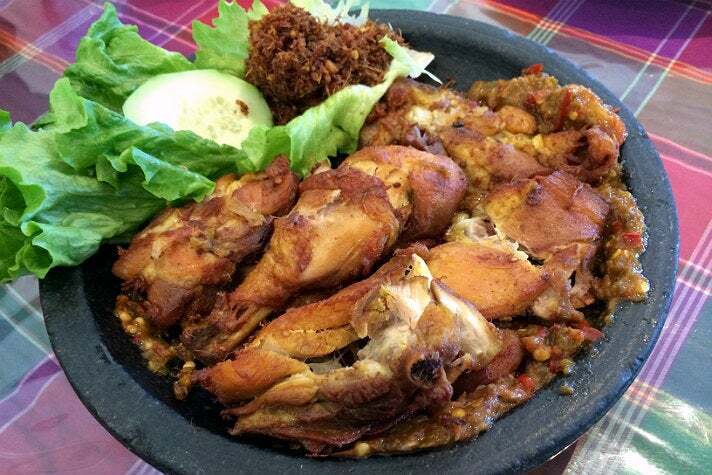 Ayam penyet stars chicken that marinates in a fragrant blend of candlenut, galangal, lemongrass and turmeric. Un-battered chicken fries in vegetable oil and arrives in a stone bowl on ferocious sambal crafted from red jalapenos, Thai chiles and dried shrimp. 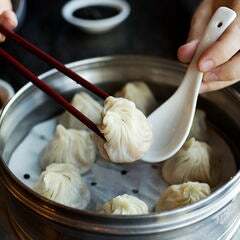 The four spices mentioned earlier form a chewy thatch, which tops the chicken. Cucumber helps to cool proceedings, which most people would probably consider spicy.